I love streusel or crumble toppings and the bigger the crumbles, the better. Throw in salted caramel, and you’re in for a wonderfully buttery and caramely treat. The bars are easy to make and you probably have everything on hand to make them now. The crust and topping are the same mixture, a nice time saver. Use Homemade Salted Caramel Sauce or thick storebought and not thin, runny, ice cream sundae sauce. Regular (non-salted) caramel sauce works too. 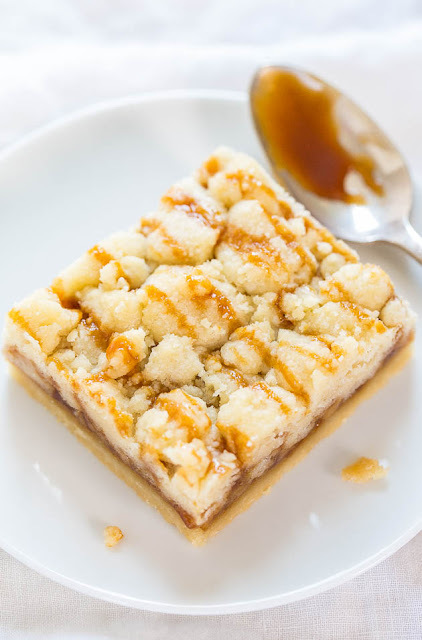 As the bars bake, the caramel sauce intensifies in flavor, and it tastes richer, more buttery, and has a more intense caramel flavor. Biting through all the layers and getting a taste of the caramel filling is the best. Soft, chewy, and gooey all in one bite. 1-Preheat oven to 325F. Line an 8-by-8-inch baking pan with aluminum foil, spray with cooking spray; set aside. 2-To the bowl of a stand mixer fitted with the paddle attachment (or large mixing bowl and electric mixer) combine the butter, sugars, and beat on medium-high speed until creamed, fluffy, and well combined, about 3 minutes. 3-Stop, scrape down the sides of the bowl and add the vanilla and beat on medium-high speed until well combined, about 1 minute. 4-Stop, scrape down the sides of the bowl and add the flour and beat on low speed until just combined, about 1 minute. Dough shouldn't be overly sticky. If yours is sticky (mine was because I baked on a humid day), add 1 to 2 tablespoons flour, or as needed, until dough comes together without feeling sticky, however don't over-do it or dough could become crumbly. 5-Turn out one-third of the mixture out into prepared pan (err on the side of going over one-third if you're eyeballing it and unsure), pressing and hard-packing it with your fingers to form a smooth, even crust layer. Bake for 20 minutes. While crust bakes, refrigerate remaining two-thirds of dough. 6-After 20 minutes, remove pan from oven, and evenly pour heaping half cup salted caramel over crust. Evenly crumble reserved dough over the top (it looks like a lot but some sinks down into the caramel layer while baking). 7-Return pan to oven and bake for about 25 to 32 minutes, or until top is barely golden browned and there's subtle signs of caramel bubbling. 8-Remove pan from oven, lightly and evenly drizzle with salted caramel, and place pan on a wire rack to cool for at least two hours before slicing and serving. Bars will keep airtight at room temperature for up to 5 days, or in the freezer for up to 6 months.